What's up with Georgian tuning? 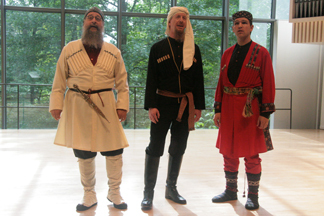 Trio Kavkasia (meaning "Caucasus") consists of three North Americans who together have more than eighty-five years of experience singing the traditional music of the Republic of Georgia. 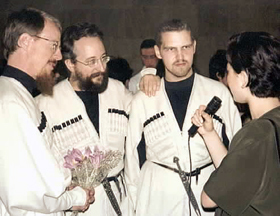 In 1994 we formed a professional vocal trio dedicated to studying and performing that music. 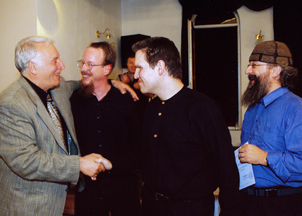 In the decades since then, we have performed everywhere from Lincoln Center to the Tbilisi Opera House. 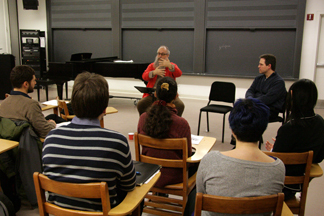 We sing concerts and lead workshops in North America, and we have made numerous extended visits to Georgia to study with singers there, both in professional ensembles and in remote villages. 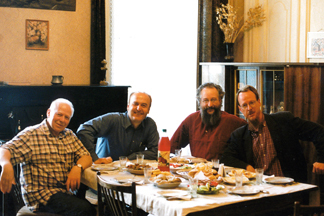 In 1997 each of us was made a State Prize Laureate and was awarded the Silver Medal of the Georgian Ministry of Culture "for profound knowledge of the folk music of Georgia and his role in its popularization around the world." 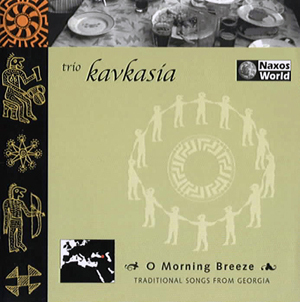 Our Albums All of Trio Kavkasia's albums are available directly from us as well as in stores. Read more REVIEWS of The Fox and the Lion. 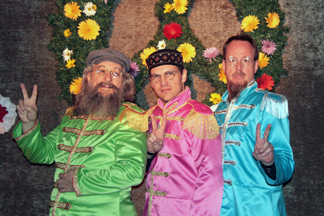 Click on the album cover image to see expanded liner notes for this album, full lyrics translations, and many photos. 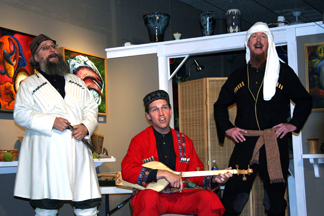 Our first	album also exists as a reissue entitled "Songs of Earthly Delight from the Caucasus," with different cover artwork. 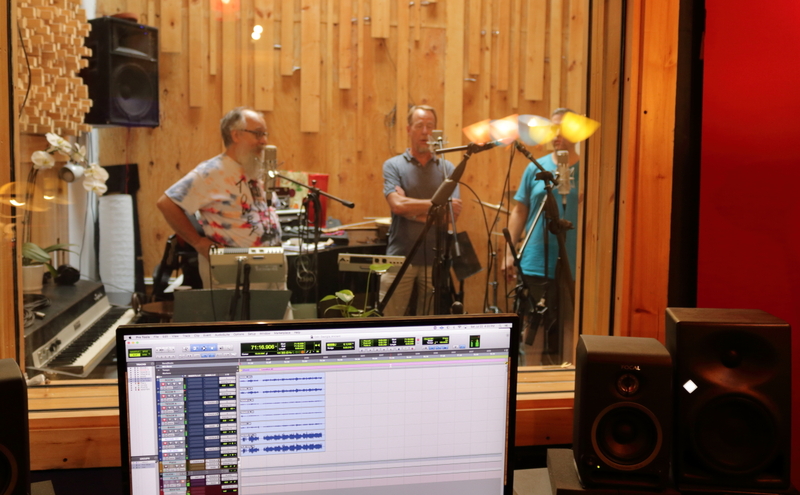 In summer 2017 Trio Kavkasia recorded the soundtrack for the "Georgia" nation expansion pack of the computer game Civilization VI: Rise and Fall. The makers of Civilization VI periodically release new countries as add-on plug-ins to the game; the Georgia expansion was part of the round released in early 2018. 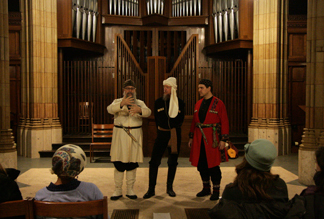 Players who choose to play as "Georgia" get the real-life Queen Tamar the Great (reigned 1184-1213) as their game avatar and national leader, and their game play is accompanied by a selection of vocal and instrumental Georgian music provided by Trio Kavkasia. The playlist during the game isn't linear; the tracks we recorded fade in and out or loop following a complex algorithm: as you encounter other nations their music starts to infiltrate yours and vice versa. If they dominate you, you hear more of their national music -- not a good sign for your prospects. 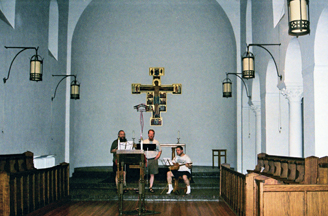 And as you advance in civilization from ancient to medieval to industrial to atomic, the musical mix changes gradually from the trio's plainest and most traditional vocal tuning and folk instruments to a smoother trio sound plus viola da gamba, and eventually to the trio plus massive choir and orchestra. So you'd probably have to play the game as "Georgia" many times (and survive and thrive into modernity) to hear all the tracks in some fashion. 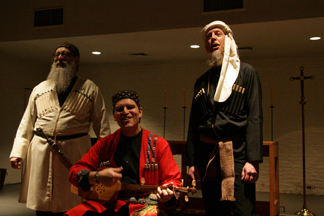 The tracks for the Ancient Era feature Trio Kavkasia alone, presenting songs in traditional form, just as we sound in concert or on our albums. 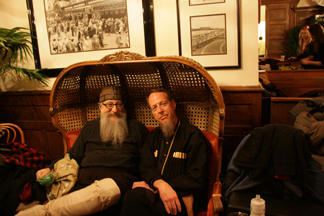 The soundtracks for the later eras (Medieval, Industrial, Atomic) were arranged by Geoff Knorr, an award-winning composer for video games and film, using the hymn Shen Khar Venakhi and the folk ballad Tsaiqvanes Tamar Kali -- the latter chosen in honor of the game avatar Queen Tamar. 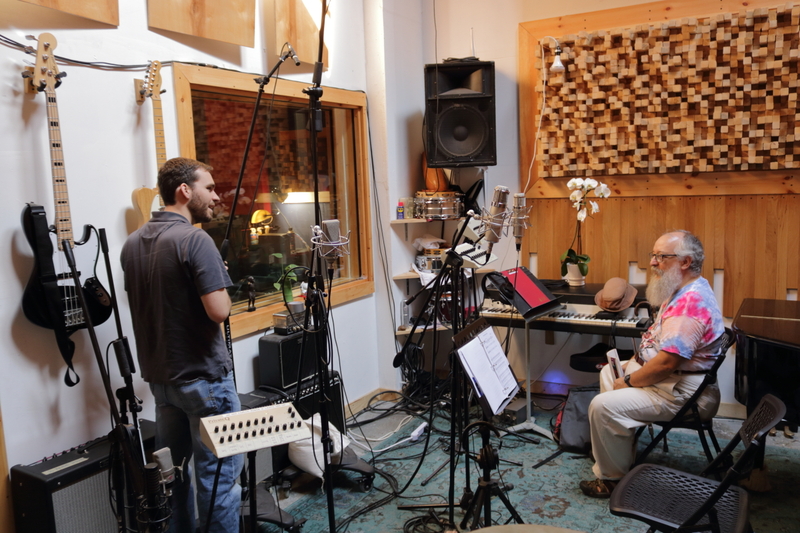 Geoff recorded our trio parts first, alone; then he added all the other instruments and massed voices to our tracks many months later in Prague. 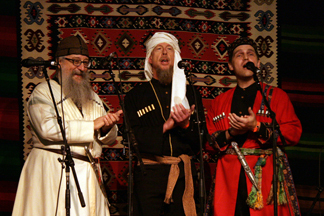 Given what computer game sales are like (especially a global hit like Civilization VI), it's possible that tens thousands of computer game fans will inadvertently hear Georgian music while playing the game; we hope at least some of them will become curious and want to know more about the country and its extraordinary music. 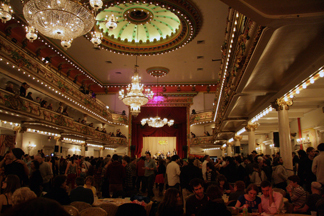 Four times in the fall and winter of 2014-15 on opposite coasts Trio Kavkasia provided a full-length live soundtrack for Eliso, a 1928 Georgian silent film directed by Nikoloz Shengelaia. 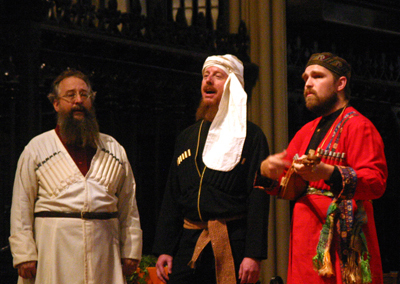 The trio performed a score created especially for the film by Carl, using a variety of traditional Georgian songs. 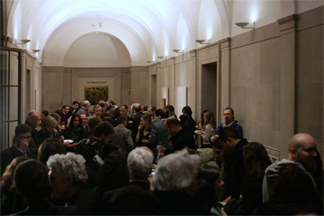 In September 2014 the Museum of Modern Art in New York opened its Georgian cinema retrospective with Eliso. 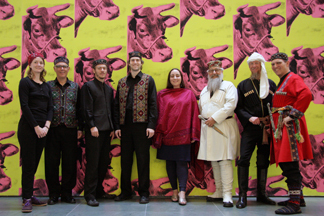 To perform the live soundtrack Trio Kavkasia was joined by members of the New York Supruli Choir. 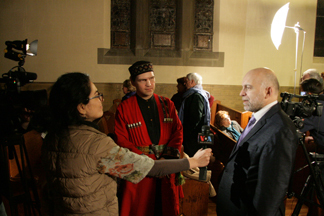 The screening/performance was attended by a large delegation from the Georgian government, including Prime Minister Irakli Gharibashvili, Ambassador to the U.S. Archil Gegeshidze, Minister of Culture and Monument Protection Guram Odisharia, and other members of the Georgian cabinet. 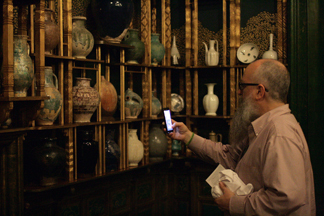 In October 2014 the University of California's Berkeley Art Museum and Pacific Film Archive (BAM/PFA) screened Eliso twice at the PFA Theater as part of its Georgian Cinema series. 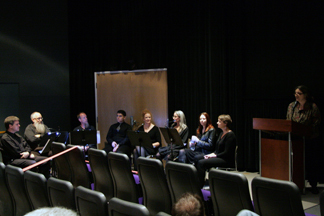 This time to perform the live soundtrack Trio Kavkasia was joined by friends from the Bay Area and elsewhere. 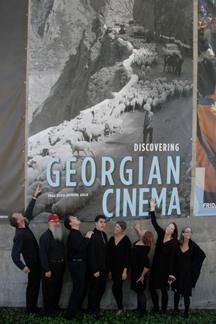 In February 2015 Trio Kavkasia once again provided the live soundtrack when the Film Department of the Smithsonian Museum's Freer Gallery of Art in Washington, DC, screened Eliso as the opening event in its Discovering Georgian Cinema series. 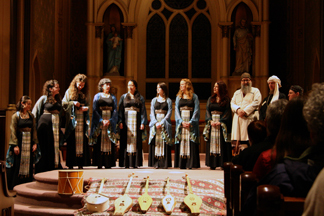 The trio was joined again by members of the New York Supruli Choir. 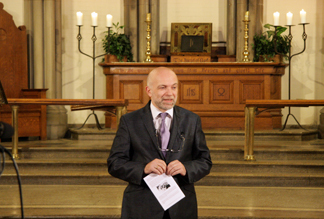 Georgian Ambassador to the U.S. Archil Gegeshidze attended and introduced the event. 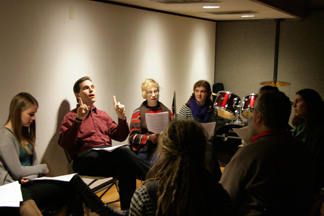 In March 2015 Trio Kavkasia provided the live soundtrack once more when Bard College in Annandale-On-Hudson, NY, screened Eliso. 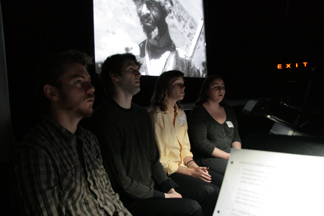 The performance was sponsored by Bard College's Center for Moving Image Arts. 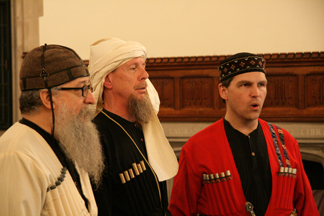 The trio was again assisted by members of the New York Supruli Choir and friends. 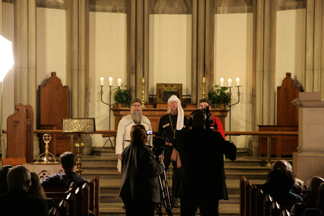 4) concert at the Church of the Holy City, Washington, DC. 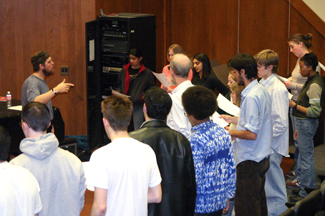 November 2011: concert at Texas State University in San Marcos with the Texas State Men's Choir and multimedia artists Irina Patkanian and Chris Langer. 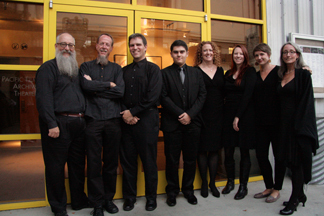 February 2011: four concerts in the San Francisco Bay Area with the women's vocal ensemble Kitka in their series Caucasian Connections. 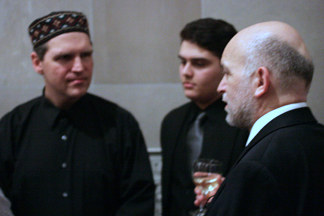 October 2008: two concerts in Toronto with the Toronto Consort as part of the Consort's Marco Polo Project. 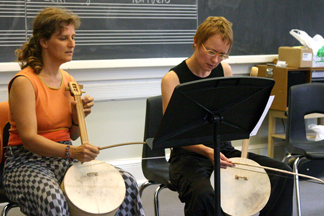 September 2008: workshop and concert at Swarthmore College in Pennsylvania. 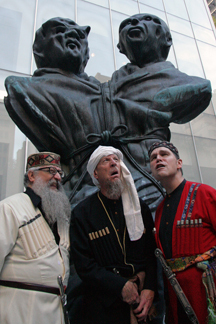 New York Times "... exotic, beautifully modulated style... haunting beauty..."
Now Magazine "... as riveting as any world beat act." 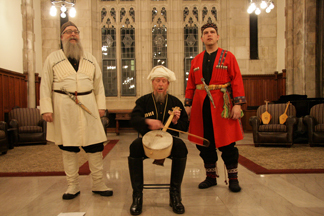 Weekend Edition, NPR "This music is hundreds of years old, its origins deep in the Caucasus Mountains, harmonious and throaty." 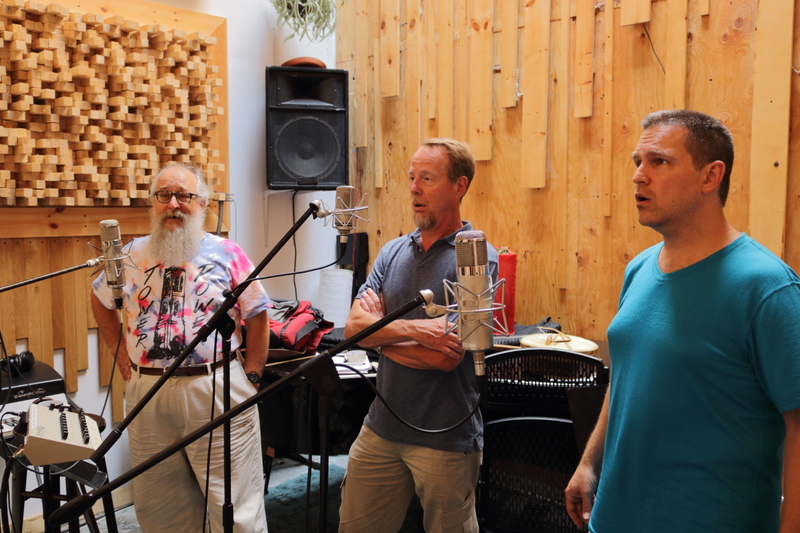 Toronto Globe and Mail "... superb blend and tuning... outstanding, both as an introduction to a rich musical tradition and as an example of highly accomplished a cappella singing." Metro Morning, CBC "This music vibrates up your body, and by the time it gets to the back of your neck, the little hairs on the back of your neck are standing up. It's quite wonderful." 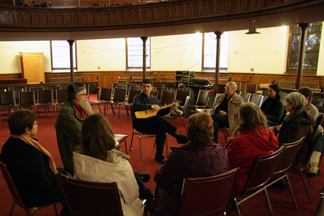 Songlines "... their performances are entirely convincing, and they've all sung with choirs in Georgia... Magnificent." 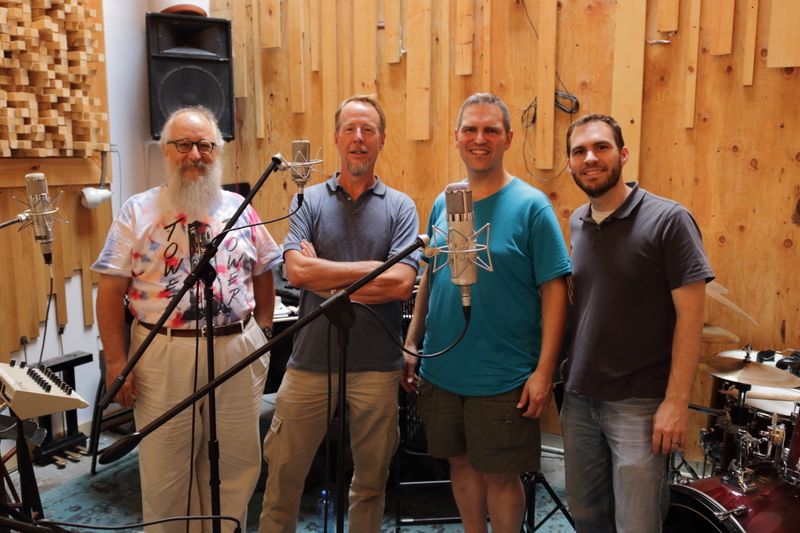 The Whole Note "... three eloquent voices and Georgian instruments (also played by the singers) blend exquisitely in unusual tunings and thrilling harmonic modulations." BBC Music Magazine "... the music sounds lush and resonant, revealing the Trio's nimble counterpoint, angular voice-leading, and strident chord tunings in all their dissonant glory." 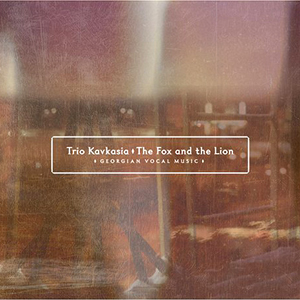 Click here to see several complete reviews of our third album, The Fox and the Lion.